4 Bedroom Detached House For Sale in Sheffield for Guide Price £310,000. 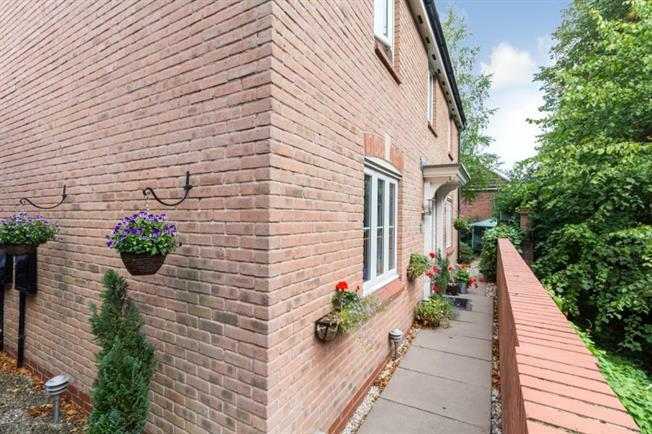 Located in the heart of the sought after and highly convenient Wadsley Park Village development, occupying a secluded position, is this beautifully presented for bedroomed detached family home. Offering spacious well laid out accommodation over two levels with the benefit of double glazing, GCH, garage, driveway, stunning landscaped gardens and lovely aspect over woodland. Ideally located for the full range of superb amenities including local shops and supermarkets, schooling, public transport links with Supertram terminus at Middlewood with access to the city, principal hospitals and universities. Nearby Hillsborough has park and leisure centre with shopping centre and bus station. Access to surrounding countryside in Bradfield Dale, Wharncliffe woods and local golf club with road network to M1 and trans Pennine routes. The accommodation comprises a spacious entrance hallway with wooden flooring, downstairs WC and stairs to first floor. The lovely lounge has wooden flooring, decorative fireplace, window to the front and French doors opening onto and having an aspect over the beautiful gardens. The formal dining room has wood flooring and window to the front overlooking woodland. The fitted kitchen has an excellent range of base and wall units in a shaker style with solid Corian work tops and uplifts. With inset stainless steel sink, integrated double oven, hob, extractor, with plumbing for washing machine and dishwasher. Having tiled floor, window to the rear and rear access door. On the first floor, the Master bedroom has wooden floor window to the front and built in wardrobe with ensuite shower room comprising WC, wash basin and walk in corner shower unit with tiled splash backs and towel rail, Double bedroom two has window to the rear and is carpeted. Bedroom three has carpeting and window to the front. Bedroom four offers flexible accommodation as guest bedroom, nursery or study. The family bathroom has modern three piece suite in white comprising WC, wash basin and bath with shower over and screen. Tiled splash backs and flooring. To the exterior of the property are beautiful landscaped gardens comprising a decked patio area with pergola providing an excellent outdoor seating and entertaining area, with hexagonal patio and a wide array of mature plants, trees and shrubs. To the side of the property is a driveway leading to the brick built garage providing further off road parking or storage. The property is located at the very end of a cul-de-sac with gated entrance and pathways to side and front. An early viewing is highly recommended to appreciate the location, size and standard of accommodation on offer.